So Brian Cox (that’s PROF Brian Cox, not Brian Cox the actor) says all the gold ever mined in the world wouldn’t fill three Olympic sized swimming pools. At first, that seemed unbelieveable, but when you think about it, olympic sized swimming pools are bloody huge! burt_dawg: @ProfBrianCox all the gold ever being mined fitting into 3 swimming pools is surely rubbish?! how do you explain wedding rings/gold bars! ProfBrianCox: @burt_dawg Why not look it up rather than simply express an opinion – how about Google? Also, when you think about it; most stuff made out of gold is tiny. If you were to melt it all, it would be tinier still. Most gold is not pure gold, which is determined by how many carrots, sorry carats. Wonder how many carrots would fit into three olympic sized swimming pools? And what would the difference be if you were to grate or mash the carrots, then condense them with three giant condensers?…. I have discovered that if your blog posts contain the word: *$ p. a M* in them, they are a lot more likely to get $ p Am comments in them, even with the Akismet plugin. This blog gets very little traffic because I don’t actively promote it yet. But my previous post about Article Jibberish (September 2009) receives most of the undesirable comments on this blog. Here is a pic of some of the latest ones (click the pic to enlarge). There’s a trend lately to say stuff like “Nice article, I agree with the last part” or “Great post. It really gives up to date information” – obviously trying desparately to find something to say that will be applicable to any site. At least have the intelligence to mention something I wrote about! The bottom one even says “Have you got any other site too?” So they can target those too, no doubt. This is what I found when I looked at my screen a few mintues ago. I was editing a word document and got up to check a paper document filed away, leaving the arm of my chair apparently on the zero key! 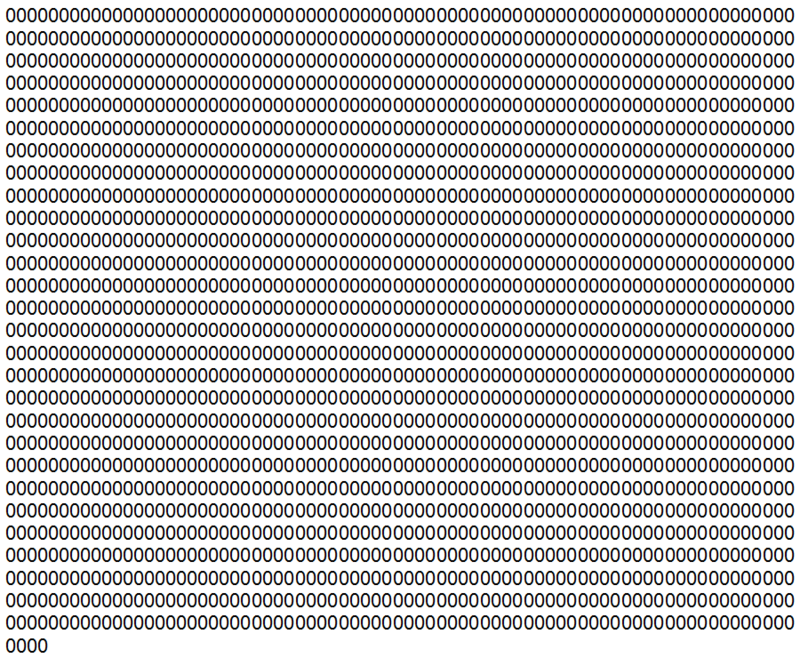 I was only away a few seconds, but this was the number of zeros it had typed before I moved the chair away from the keyboard. I didn’t count them before deleting it (which I could have done easily in Word’s tools), so you’ll have to count them yourself. I wonder if my chair was trying to tell me something; like how many people laugh at my jokes, or how many non$p*mming people will visit the site this week, or how much money I’m gonna make if my musical ever gets made. 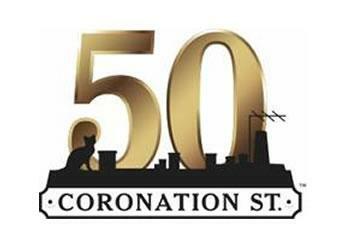 The longest running TV soap is 50 this week, and I watched the hour long live episode last night, although I had to stop watching it regularly a few years ago, as it takes up so much time, being on god knows how many times a week these days. I can’t remember what year it was; but it was straight after the brilliant Karen left. After the live episode it showed a countdown of the nations favourite story lines, and although I was an avid watcher, it wasn’t the psycho-killers and love triangles I had most remembered. I had watched it for several decades religiously and it is odd little pieces of dialogue that I find have stuck in my head. I remember in the 80s, Hilda telling Kevin Webster and Terry Duckworth (while fighting over Sally) that “we were all young and daft once…”. I remember Fred Elliot commenting in The Rovers that he isn’t surprised that Curly and Emma are in a relationship because you always find that professional people end up with other professionals. He said “…You get doctors and lawyers, you get nurses and fire fighters… teachers and… (after some thought) …other teachers…” I have underlined the part of each word that contained his repetitive higher-pinched inflection. Wish I had a recording of that. It’s much more funny to hear it. I remember how Jack always called Vera “my little swampduck” (which I used for one of my animated Boyfriend Girlfriend movies). And one of my favourite secondary story lines was the one where elderly Percy was bragging to everyone how his budgie Randy, had lived for 18 years, and how he was going to get the Guinness Book of World Records involved, as he was certain he had the world’s oldest budgie. But his friends were then forced to tell him that Randy had died many years ago and they had felt responsible, so they had replaced him! That story was not mentioned of course, as it was mostly the main big story lines people remember. But I am glad it was a comedy moment that won the top 50 favourite Corrie moments (out of a large majority of tragedies), thanks to Blanche being anything but sympathetic towards an alcoholics anonymous group. I missed that, as it was since I stopped watching it, but Corrie has always had some of the best humour – much better than a lot of British sitcoms IMHO. I also lucked out the other day when I checked out BBC4′s The Road to Coronation Street, thinking it would be some lame documentary of info I’d heard before. But it was a superb dramatisation of Tony Warren’s (writer and creator) struggle to get the show on our screens in 1960. I thought Jesse Wallace was excellent as Pat Phoenix “the bird who burnt its bum” Pat said! It was also good to see Michelle Holmes in it too, who played Tina Fowler in the Street back in 1989-1990. I wonder how long the legendary soap will keep going. Maybe it will never stop going. It’s one original star from the first episode William Roach (Ken Barlow) can’t be immortal, but the show could well be. Who knows? A few years ago, the British police decided to change the term RTA (Road Traffic Accident) to RTC (Road Traffic Collision). Well, sorry to break it to you, but there is a reason for everything, so you are actually saying there is no such thing as an accident. Yes, there is a reason for every single thing that happens in the universe. Just because you don’t know the reason, doesn’t mean there isn’t one. “My kids are naughty for no reason” – No, they’re unhappy and need positive attention. “He gets angry for no reason” – No, he has depression or autistic spectrum disorder (includes dyslexia). “What Causes Bruising for No Reason?” – An oxymoron if ever there was one. If there’s a cause, then there’s a reason. “The car in front careered out of control for no reason” – The car in front is a Toyota (with a dodgy computer, that was eventually recalled after several people died). An Accident does NOT imply that no-one was to blame. An accident means that its cause was not deliberate. Most accidents are someone’s fault. “My three year old daughter had an accident” – Your fault. You never took her to the loo. “He broke a glass vase by accident” – His fault. He was carrying too many boxes and couldn’t see where he was going. Also Mother’s fault for putting the expensive vase where it could be knocked over. “We’re not covered for accidental damage” – Your fault. You got the cheapest roofer in the yellow pages, resulting in roof slates falling on your car. So folks, you can go ahead and scrub the word Accident from your dictionary, because according to “Sub-seven” (is that his IQ? ), for something to be an accident, it has to have happened for no reason at all. What is more likely to be the actual reason the police dropped the word “accident”, is that nowadays there are a lot more deliberate road collisions, so of course they are not accidents. They are criminal acts designed to claim thousands on the other driver’s insurance. And as it is not always obvious straight away which are the genuine accidents and which are the deliberate collisions, they are all now refered to as “collisions”. Either that is what Sub-seven meant and he didn’t explain it properly, or he doesn’t understand why they dropped the word “accident” himself. This morning I greeted my dog Sadie (a mixed race mut, believed to be staffy and German Shepherd) in the usual way. I said “Hellooo!” in that special sing-song voice reserved only for animals and toddlers, and she returned the greeting in her own wag-tail way. It made me think that I’ve probably never been as nice to humans as I am to dogs. Is that terrible? 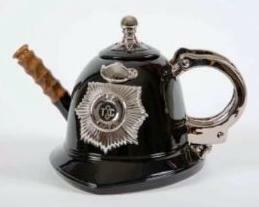 Or is it a blessing, seeing as I would probably be arrested if I was? What if we stroked people’s hair (personal hygiene standards permitting)? Or if we gently rubbed people’s hands if we think they are nice, whether or not we actually know them? God – the thought is making me feel sick. which makes me convinced that a tail wag is a dog’s equivalent of our smile, which, don’t forget, we also do when we are embarrassed and uncomfortable. So there you have it. That is why dogs wag their tails. I was on a train this afternoon (on my own) and was sat near a group of about six people. They were talking about the British TV License (Licence UK sp). Basically for those of you who don’t know; anyone who owns a TV in the UK has to pay £145.00 a year for a TV license, or they can be fined up to £1000.00. The BBC (that has no advertising) is totally funded by the TV license. One of the group confessed he had never had a TV license before or since he was married, and does not plan to get one either. His friends argued that the cost of the license for everyone else is so high because of people like him who refuse to pay. He then put forward the argument that he should not have to pay for a TV license because he does not watch BBC channels; only the other commercial channels. And he then reamed off the programs he likes to watch, and of the ones I’d heard of, they all seemed to be on terrestrial UK commercial channels. His friends could not believe he doesn’t watch a single BBC program and quizzed him saying stuff like “what, you don’t watch sport on the BBC?”, “you don’t watch The News?”, “not even Doctor Who?” He still claimed he didn’t. Then after a long list of programs, he declared “The only BBC program I have seen in years is Hustle”. A drama about a group of con artists. I think only one member of the group saw the irony, but this particular statement quite tickled me, and I had to do that thing where you feign a coughing fit to try and cover up your stifled giggles. Serves me right for listening in, I guess. 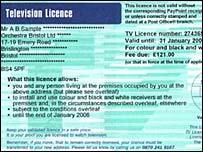 Despite being a nonconformist in many areas, I conform to buying a TV license as it’s cheaper than a £400 fine, which a friend of mine once had to pay. Which reminds me of another funny story. A few weeks after my friend got fined in 1991, an annoying relative invited me to go out, and I was not in the mood to go out with them, so I made up the story that I could not afford to go out as I had just been fined £400 for not having a TV licence. (I had got a TV licence). I had only wanted to stop them badgering me to go out, but my tale of expense also forced them to rush out and buy a TV licence themselves! Some fibs get you double points. My friend was one of the extras in Sherlock (2010) so I watched it and even though she wasn’t in the last episode, I was still intrigued enough to watch as the “moriachi” result of the first episode wasn’t explained. You’d think I didn’t have any work to do from the image above (Heaven forbid anyone should ever come between Ant and Dec).